Is life really so complicated? Ask happy and successful people this question and youre likely to hear that, in its essence, life is really quite simple. 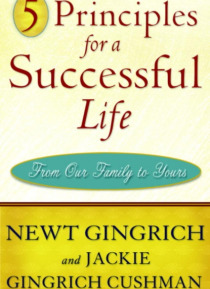 In these pages, Newt Gingrich and his daughter Jackie Gingrich Cushmanwith the help of prominent people they know and admire, such as Bill Clinton, Rush Limbaugh, Mary Matalin, and David Petraeusshow how, by following just five principles, you can… live life to its fullest: Dream Big Like Walt Disney, who shared the magic kingdom of his imagination with millions, or like Jackies sister, Kathy, who didnt let a severe case of rheumatoid arthritis stop her from completing a walking marathon, see where your dreams can take you. Work Hard As Jackie points out in her recollections of her dads early political career, working hard can be a surprising source of energy, and adopting an attitude of cheerful persistence will help you reach your goal. Learn Every Day The key is to re- member that learning is a reciprocal process. You cant be passive; you must be engaged. Come along on a visit to the acclaimed Ron Clark Academy in Atlanta to see how this principle works in action. Enjoy Life And whats the best way to do that? From the wisdom of the ancient philosophers to information from the latest scientific studies, the answer is the same: Be grateful for all your blessings and do something every day to show compassion and generosity to others. Be True to Yourself It sounds easy, but its the hardest principle to live by. Discover what people from William Shakespeare to Henrik Ibsen to John P. Abizaid have had to say about this touchstone for an honest life.With these inspiring and memorable words of wisdom, Newt and Jackie have given us a book to treasure for a lifetime.From the Hardcover edition.